One of the fastest growing and most exciting segments in motorsport today is historic racing. With premier events all over the world, and a growing legion of enthusiasts eager to tame their legendary racecars, these complex and powerful beasts are in constant need of experienced restoration, preparation, and support. Canepa Motorsport was created to fulfill these needs. We understand that historic racing requires a unique approach; that these historic racing cars need to function as they did in their heyday; that they need to look as they did when they made history; and finally they need to do all of this while being reliable and safe. Our motorsport specialists draw from years of experience in the garages of IMSA, Trans-Am, Indy, Formula One, Can-Am, and Le Mans. Each one is adept at using period materials, tooling and parts, and knows the period techniques to make them work. This depth of knowledge allows us to offer a broad spectrum of services to the historic racer, from pre-purchase inspections and event preparation and support, to complete mechanical and cosmetic restorations and tuning. 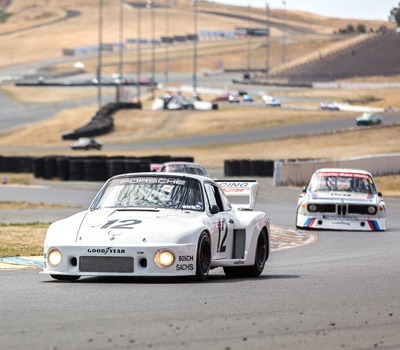 We actively participate at the Rolex Monterey Motorsports Reunion, the Porsche Rennsport Reunion, Coronado Speed Festival, and the Sonoma Historics in addition to selected major events across the United States. There you will see the Canepa Motorsport staff and transporters supporting dozens of high-end privateers driving everything from a 50's Maserati Birdcage to a 80's Porsche prototype.